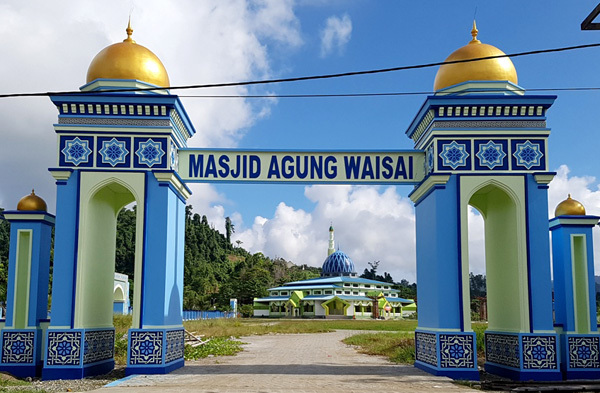 Waisai City is the capital of Raja Ampat Regency and it becomes a significant checkpoint in exploring any islands in Raja Ampat. The location is in Waigeo Island, which is the biggest island of the region. Apart from beaches and other natural attractions, there is a grandiose structure called Waisai Grand Mosque. The original name was Nurul Yaqin and the size wasn’t as big as today. Like other regular mosques, it is the place for worshipping among Muslims. However, it also becomes an interesting tourist spot in Waisai. Thanks to its majestic structure and interesting design. The whole size of the land is 30,000 m2. The fact is that the land was given by the locals to a charity. When it comes to the size of the mosque, it is about 1,800 m2. With such enormous size, the structure is able to accommodate about 1,000 people! Next, it is related to the color of the mosque that combines green and white. Also, the dome is dominated by light blue color. In front of the mosque, several wooden ornaments are arranged beautifully. They come in a symmetrical design, actually. It is true that tourists come to the mosque to witness an amazing structure of it. However, some of them decide to come to Waisai Grand Mosque to learn about its history. According to the locals, Nurul Yaqin was built in 2003 and the first priest was Halimun Manam. At the time, the size was small. It couldn’t accommodate the increasing number of Muslims in Waisai, so the government decided to renovate it. Today, it has a bigger size with some interesting ornaments. The locals use it for worshipping and reading Quran every day. For tourists, there is no fee to enter the mosque. However, it is better to donate some money there. The purpose is to help the keeper to take care of the mosque, especially in terms of cleanliness. The best time to visit the mosque is in the morning, as it is less crowded. It is because the mosque is filled with worshippers during “Shalat Lima Waktu”. Taking pictures is allowed as long as it doesn’t disturb the people inside the mosque. Apart from the locals, visitors also come from different regions. Some foreigners are also seen there, as they are interested in the structure of the mosque. For Muslims, the mosque can be both a place for worshipping and sightseeing. In fact, the mosque can be a resting place during a vacation in Waisai. Though, visitors should take care of the environment and never make any noises. That’s common sense. As the name suggests, the mosque is located in Waisai City. For those coming from Jakarta, the destination is Marinda Airport, which is located in Waisai. Once they get to the airport, they can take a minibus or any local transportation service to the mosque. The whole trip is not tiring, as long as tourists use the right choice of a vehicle after all.